Mad Catz launched two new products at MWC 2015 – the pocket-sized L.Y.N.X. 3 and the S.U.R.F.R, a crazy combination of gaming controller and mini Bluetooth keyboard that works across platforms. It can never be said that Mad Catz doesn’t think outside the box. The S.U.R.F.R is a unique device and one that could bring the best of both worlds to the ever-expanding range of Android and PC TV set-top boxes. The S.U.R.F.R is an impressive controller. The rubbery, soft-touch qwerty keyboard is a revelation. The keys are small, but have a raised centre to make them easy enough to differentiate and provide a satisfying click when pressed. In fact I wrote several paragraphs using the S.U.R.F.R without making a single mistake. That surprised me, considering I struggle to write out a password correctly on the mini Bluetooth keyboard I use with my set-top PC. The dual analogue sticks are also solid. Controls are responsive and they feel as good as any mobile gaming controller I’ve used. As well as sticks you get a D-pad surrounding the left stick, shoulder bumper buttons and an adjustable grip. It really is very clever indeed. 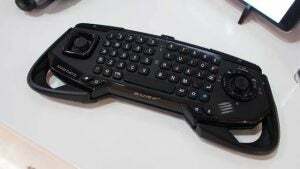 The Mad Catz S.U.R.F.R can be used with a PC and has dedicated buttons for media playback, but also a toggle that lets you use the left analogue stick as a mouse. Anyone who’s used a PS4 will know a touchpad is preferable to an analogue stick in this scenario, but an analogue stick will do the job in a pinch. Whether the S.U.R.F.R will be right for you depends on whether you value its ability to play games over having a touchpad to use as a mouse. However, as an Android controller, where a mouse pointer is less relevant, the S.U.R.F.R provides the best of both worlds. The S.U.R.F.R is an innovative keyboard controller that’s useful in a number of different cases. At $79 it’s not too expensive either. The Mad Catz S.U.R.F.R will be available to buy at the end of March or early April. The post Mad Catz S.U.R.F.R appeared first on Trusted Reviews.